This guide provides an overview of legal resources available in the VVC library, primarily focusing on California legal research. Depending on the type of information needed - locating a case, identifying a code, answering a legal question - the guide lists relevant sources, both print and electronic, for each section. Remember that currency is a key component in legal research. Be sure to check the "pocket part" supplements for the most current revisions, cases and laws. Supplements can be separate, or inserted in the back of each volume. The vast majority of cases in the California courts begins in one of the 58 Superior or Trial courts — located in each of the state's 58 counties. With more than 450 locations, these courts hear both civil and criminal cases, as well as family, probate, and juvenile cases. These courts are often the sites of the "media circus" cases (O.J. Simpson, Casey Anthony, Dr. Conrad Murray, etc.). It is important to note that the decisions of these courts are not published in the legal case reporters. The next level of judicial authority within the state's judicial branch resides with the Courts of Appeal. Most of the cases that come before the Courts of Appeal involve the review of a superior court decision that is being contested by a party to the case. The state is divided geographically into six appellate districts, each containing a Courts of Appeal. The California Supreme Court serves as the highest court in the state, and has discretion to review decisions of the Court of Appeal in order to settle important questions of law and to resolve conflicts among the Courts of Appeal. The court also must review the appeal in any case in which a trial court has imposed a judgment of death. For further information on the California State Court System, see the California Courts website. Cal Jur 3d is a legal encyclopedia published by the West Group. There are over 70 volumes in the set, arranged alphabetically by legal topic. Each topic contains relevant references to California codes, regulations, case reporters, the West California Digest key number, and Witkin. Separate volumes at the end of the set include a subject index, a table of cases, and a table of statutes. A multi-volume set that presents expert analysis and an extensive, integrated treatment of all major California substantive law topics: Workers' Compensation, Parent and Child, Husband and Wife, Personal Property, Torts, etc. Relevant references to California codes, regulations, case reporters, and the West's California Digest key number system are provided for each topic. A separate index volume is also available. In the example above, Key number 204 refers to "Child's preference" within the topic of Child Custody. Cases on this point are located in the digest under "Child Custody" followed by the key number. Digests are often useful for locating on-point cases based on key numbers referenced in secondary sources. The library contains volume 1-1st series (1 Cal. Rptr. 1) through volume 116-3rd series (116 Cal. Rptr.3rd 192). Other than the opinion, cases reported include the West's Key numbers and headnotes. Later cases can be accessed through the online sources below. This link opens to the opinions section of the Judicial Branch of California's website for published opinions from the "Official Reports" of the California Supreme Court and Courts of Appeals from 1850 to present (current within 90 days of filing). After opening the link, check the "I have read..." box at the bottom of the page and click "Begin Searching Opinions." When the page opens, note the "Search" options in the left column: By Citation Number, Party Name, and Keyword. "Slip opinions" (unedited prior to being published) from the last 120 days are searchable from the Judicial Branch main page. "Unpublished opinions" of the California Courts of Appeal are also posted for 60 days solely as public information about actions taken by the courts. Note: LexisNexis is the official publisher of the California Official Reports and provides free limited access to California court opinions. The Deering's California Codes Annotated file (CACD) contains the statutory code for the State of California as published in the compilation entitled Deering's California Codes Annotated. It includes all laws of a general and permanent nature, as enacted by the California Legislature.Note: California Code archives are available from 1991. Provides access to California Supreme and Appellate Court Cases from 1934 to the present. "Advanced Search" opinions include citation number, docket number, party name or full-text keyword. Opinions are displayed in MS Word or PDF formats. Note: FindLaw requires free registration to view full-text opinions. Pen. Code, § 2450 = Penal Code, section 2450. Family C. 7897(c) = Family Code, section 7879, subsection (c). Two annotated versions of the California statutory codes are published commercially. The code is also available from the California Office of Administrative Law website. In addition to the actual text of the codes, West's annotated codes provide references and summaries to judicial decisions, regulations, and attorney general opinions relating to that statute. Citations to secondary sources related to the statute can also be found along with law review articles and practice guides. This California Office of Administrative Law website contains the full-text of the 29 codes and the State Constitution (text only, no annotations). Search by code section or keyword. The California Code of Regulations is comprised of 28 Titles and are governed by state agencies who are empowered to make rules and procedures, called regulations, to implement state statutes (example, the California Building Code). The California Code of Regulations is abbreviated as "CCR.” A citation is read "25 CCR 60". The first number is the title number and the second number is the section of the code. The Library does not contain a print copy of the CCR, but it is available online through the California Office of Administrative Law website (CCR) and Nexis Uni. Note: The terms "Code of Regulations" and "Administrative Code" are often used interchangeably, however as of 1988, the “Administrative Code” no longer exists. Nexis Uni is a Library database that is only available on-campus. The database contains Federal and State Cases, Codes, and Regulations. Also included are Legal References (legal dictionary, encyclopedia, etc. ), Shepard's Citations, and full-text Law Review articles. 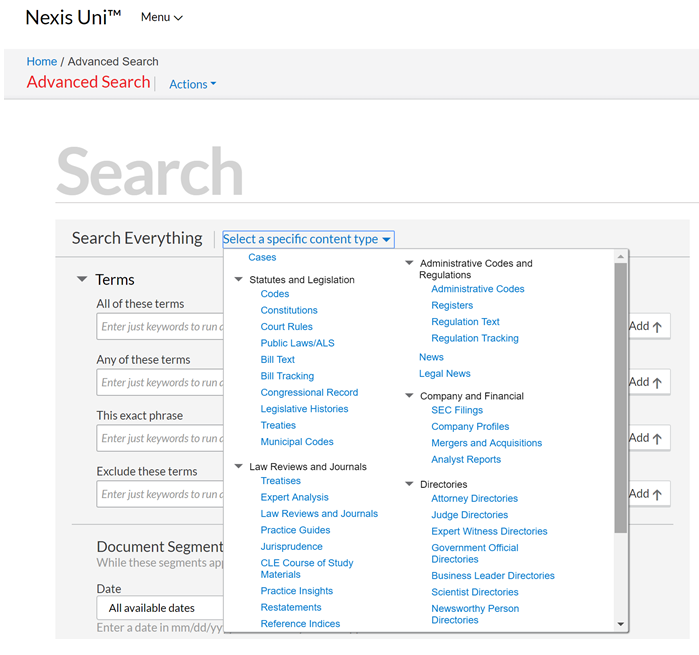 With Nexis Uni, you can can use the main search box to search for news, cases, law reviews and more. You can also search for specific cases using the guided search under the main search box. 4. This second example displays a search for State Case. Although the Guided Search option is convenient, you can use the Advanced Search to narrow your results by content type. Click on the Advanced Search and click on Select a specific content type for more search options. Notice that you can limit your search by Cases, Statues and Legislation Law Reviews and much more. The "Advanced Options" page also allows you to apply search limiters to cases by date, party name, specific courts and even attorney name. 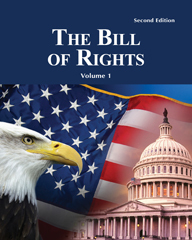 The Bill of Rights is a comprehensive survey of all aspects of the U.S. Bill of Rights; from its origins to its role in modern American history. Special attention is given to the organic relationship of the Bill of Rights to the original Constitution, its ongoing interpretation and incorporation by the U.S. Supreme Court, and the political and social issues it has spawned. Publication Date: 2014, 10th ed. This comprehensive law dictionary contains more than 50,000 terms and includes definitions of more than 1,000 law-related abbreviations and acronyms. More than 7,500 terms new to this edition. Publication Date: 2010, 19th ed. Contains over 40,000 definitions of legal terms based on the actual construction of those terms by courts of last resort. Each term includes the case cited to the page on which the definition appears. A 2 volume encyclopedia that defines the 27 amendments in comprehensive chapters with supportive materials including debates, articles, reports, and Supreme Court cases. 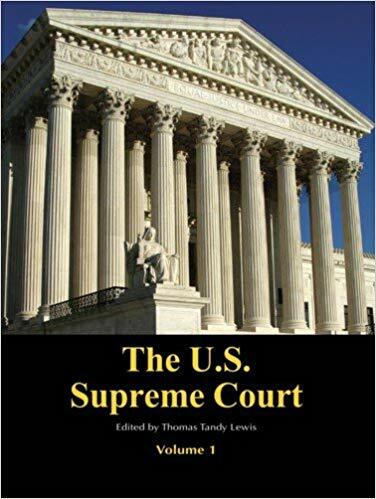 With its blend of accessible writing and actual excerpts from Court opinions, this book serves to explain the legal and cultural underpinnings of landmark U.S. Supreme Court decisions of the past 35 years-and to illuminate how these decisions have shaped the trajectory and character of modern American society. 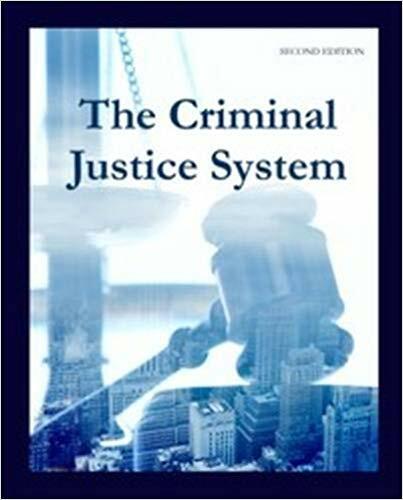 The Criminal Justice System, completely updated, covers the most important aspects of criminal justice in the United States. It details the commission and frequency of crimes through the investigation, apprehension, prosecution, and punishment of wrongdoers. Summaries of Leading Cases in U.S. Constitutional Law is the most up-to-date and historically thorough guide to the American Supreme Court s most monumental rulings available today. Gale Encyclopedia of American Law by Donna Batten, ed. Publication Date: 2011, 3rd ed. Authoritative, current, and easy to use, this book is an outstanding resource for readers looking to gain an accurate and thorough understanding of American juvenile justice. * Presents historical and contemporary data in an easy-to-understand fashion that survey the complex history of the juvenile justice system and allow readers to better comprehend the key issues * Includes a perspectives chapter that enables readers to hear voices from individuals with different backgrounds who are concerned with juvenile justice * Provides an ideal resource for general readers who want to learn more about the history and current events concerning juvenile justice as well as students without previous background knowledge of the subject * Contains a chronology of key moments in the history of juvenile justice in the United States as well as a glossary of key terms and definitions to guide the reader. Offering perspectives from a range of experts, both academic and nonacademic, this reference book examines the development of prisons in the United States and addresses the principal contemporary issues and controversies of our prisons and prison systems. * Presents a comprehensive yet succinct history of the development of men's and women's prisons in the United States * Offers a range of author perspectives that identify and explore the principal issues associated with prisons and imprisonment * Documents the shift from an intent to reform inmates in prisons to retribution and an attempt to remove all criminals from society, using prisons for "warehousing" of undesired elements * Provides a complete reference guide for the understanding of prisons and imprisonment as a punishment. The U.S. Supreme Court is a comprehensive survey of the history and functions of the institution for which it is named. Although it has only nine unelected members, the Court alone can overturn the actions of every other branch of government, at all levels. There is no other institution quite like the Supreme Court-in the United States or anywhere else in the world. Published by West Publishing Company, Am Jur 2d is an encyclopedic text of both procedural and substantive American law, state, federal, criminal, civil and procedural. Consisting of over 430 topic headings (titles), articles collect, examine, and summarize the broad principles of American law and, at the same time, provide direct leads to supporting cases, related annotations, forms, proofs, and trial techniques.